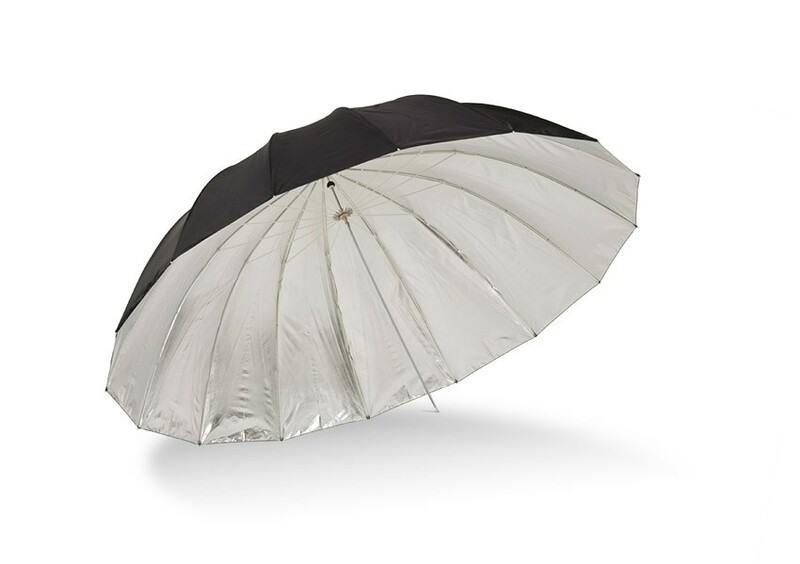 A parabolic style silver umbrella with a black backing and a silver interior surface throws the light a lot further than the white umbrella and gives a gradual fall-off making it ideal for feathering. Photoflex® adjustable reflective Umbrellas were already the most versatile photographic umbrellas available today; and now they’re even better. The new and improved umbrella line includes ribs and strut pivots that are now made from a fibreglass composite, which is not only stronger, but also offers better resiliency and durability than steel or aluminium. This new design feature allows for almost carefree handling, all but eliminating damage caused from over bending delicate steel tube ribs. All umbrella centre poles are extruded and closed off at the base (vs. folded, hollow tubes, like many other umbrellas, that are easily bent and dented) adding to the durability of the Photoflex® umbrella model. Can be used for strobe or hot lights. Also available in 30" (UM-ADH30) & 45" (UM-ADH45). Shaft diameter is 8mm.